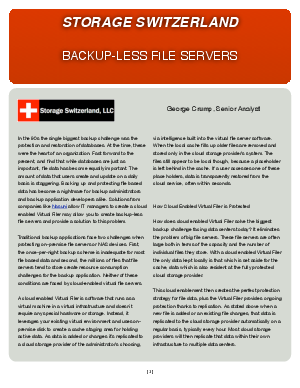 How does cloud enabled Virtual Filer solve the biggest backup challenge facing data centers today? It eliminates the problem of big file servers. These file servers are often large both in terms of the capacity and the number of individual files they store. With a cloud enabled Virtual Filer the only data kept locally is that which is set aside for the cache, data which is also resident at the fully protected cloud storage provider.